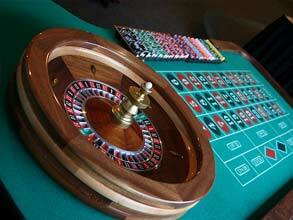 The betting area on a roulette table is called the layout. The French layout has a single zero and the American one exhibits both a single and a double zero. The French style layout, with the wheel in the center of the roulette table, can still be found in the Monte Carlo casino. The American style layout, which places the wheel on one of the table sides, can be encountered in almost all the casinos in the world. Straight (or Single) You wager on a single number, by positioning the chip in the center of a numeral square on the roulette table. Split Split is a bet on the line that separates two numerical squares on the roulette table, placed either on the vertical line or the horizontal one (as in 14-17 or 8-9). Street Street is a bet on a single horizontal line comprising three numbers: the chip has to be situated on the edge at the line’s end. Corner (or Square) Corner is a bet placed on four numbers that are in a square layout (as in 11-12-14-15). The chips/chip are/is placed at the intersection of the vertical and horizontal lines that run through the four square numbers. Six line (or Double Street) Six line is a bet on two neighboring streets – the chip will be placed at the corresponding intersection. Trio Trio is a bet placed at the intersection between 0, 1 and 2, or 0, 2 and 3 (this applies only to the single-zero layout). Basket (or the first four) Basket is a non-square corner bet on 0, 1, 2, and 3 (this also applies only to the single-zero layout). Top line Top line is a bet on the numbers 0, 00, 1, 2, and 3 (this is valid for the double-zero layout only). The chip can be placed either on the corner of 0 and 1 or that of 00 and 3. Outside bets have better odds at winning but offer smaller payouts. This is a bet placed on one of the first, low eighteen numbers. This is a bet placed on one of the latter, high eighteen numbers. This is a bet on which color the roulette wheel will display. This is a bet placed on even or odd numbers and does not include 0. For these you have three choices: P12(premier douzaine in French) or the first dozen(1-12), M12 (Mayenne douzaine in French), a.k.a. the second dozen(13-24) and D12 (Derniere douzaine in French), which is the third dozen (25-36). 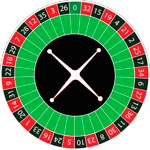 They are wagers placed on all twelve numbers on any of the 3 vertical lines of the roulette table layout, with the chip positioned in the space below the final number in this column. Technically, the 0 and 00 pockets on the roulette wheel constitute the only advantage of the house. This is because when you make an outside bet, you will always lose if the ball lands in one of the 0 and 00 pockets, but in fact this is not the only house edge because they only pay 35 to 1 for a winning single bet, even if mathematically there is the probability of 1 out of 37 (1 out of 38 for American Roulette) to win a bet on a single number. For example, if you place a one-dollar bet on all inside numbers and also 0 and 00, you will certainly win, but only $35 when your original bet cost you $38. In the early ages of gambling, the house could set the odds at 27 to 1: this meant that upon betting $1 you would win $27 and the house kept your dollar. Nowadays, the casino odds are set by law and they must be either 35 to 1 or 34 to 1.